Comics Impulse v2: Wonder Woman, Batman Animated Features Coming Soon? Wonder Woman, Batman Animated Features Coming Soon? On the mystical island of Themyscria, a proud and fierce warrior race of Amazons have raised a daughter of untold beauty, grace and strength – Princess Diana. When and army fighter pilot, Steve Trevor crash-lands on the island, the rebellious and headstrong Diana defies Amazonian law by accompanying Trevor back to civilization. Meanwhile, Ares (the god of War) has escaped his imprisonment at the hands of the Amazonians and has decided to exact his revenge using the mystical “Hand of Rage,” an ancient artifact with the power to raise armies from the dead and infuse them with a thirst for blood. Ares intends to start a world war that will not only last for centuries – but will wipe out every lving being on the planet, starting with the Amazons! 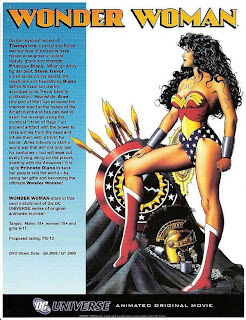 It is up to Princess Diana to save her people and the world – by using her gifts and becoming the ultimate Wonder Woman! Target: Males 18+, women 18+, and girls 9-17. 2-4 weeks in advance of The Dark Knight film release. Set in the period between BATMAN BEGINS and THE DARK KNIGHT, this brand new adventure follows BATMAN as he unravels a mystery over six original stories done in the style of Japanese Anime. Each of the six original stories has been written by a highly respected screenwriter or comic book creator. The talent includes Academy Award nominee Josh Olsen (The History of Violence), screenwriter of the Blade films and Batman Begins David Goyer, and famed comic book writer Brian Azzarello, among others. 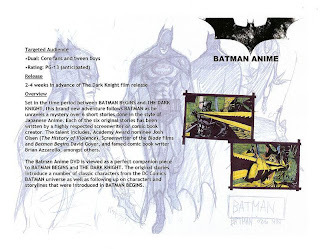 The Batman Anime DVD is viewed as a perfect companion piece to BATMAN BEGINS and THE DARK KNIGHT. The original stories introduce a number of classic characters from the DC Comics BATMAN universe as well as following up on characters and storylines that were introduced in BATMAN BEGINS. Now it's just a matter of when these features actually debut.